One of the most important components of online business is creating a trusted environment where potential customers feel confident in making purchases. Note: An SSL Certificate is a website security certificate. Now, here is the big thing. Have you heard about Google’s new SSL requirement for websites? Do you know that you can make passive income from this? I mean up to $100 to $1000. I personally made $500 with this on Fiverr. (share my result later) All I did was to simply list out my service as a professional on SSL Certificate Installation. Maybe you do not know; over 90% of sites are affected and most local business owners are completely unaware. Once a business owner learns about this problem and how it will cost them customers and revenue, they become desperate to find a solution. They wouldn’t want to loose their visitors or appear unprofessional. There is MASSIVE opportunity over the next few months just reselling SSL certificates to business owners who NEED them after this Google update and you can easily help people install SSL on their sites. Google is scheduled to release an update to its chrome browser that will warn visitors when a website they are visiting does not have an SSL certificate installed. In fact, if you check some sites on Chrome, you should be getting such warnings. The reason is simple. They aren’t secured just because they don’t have an SSL Certificate installed on their website. You see Forbes itself talked about it! Let me shed more light about this. SSL certificates are a way for websites to keep their visitor’s information safe by encrypting the communication. You’ve certainly seen websites that have this encryption, their address starts with ‘http’ instead of just ‘https’ (the “S” literately stands for secure). 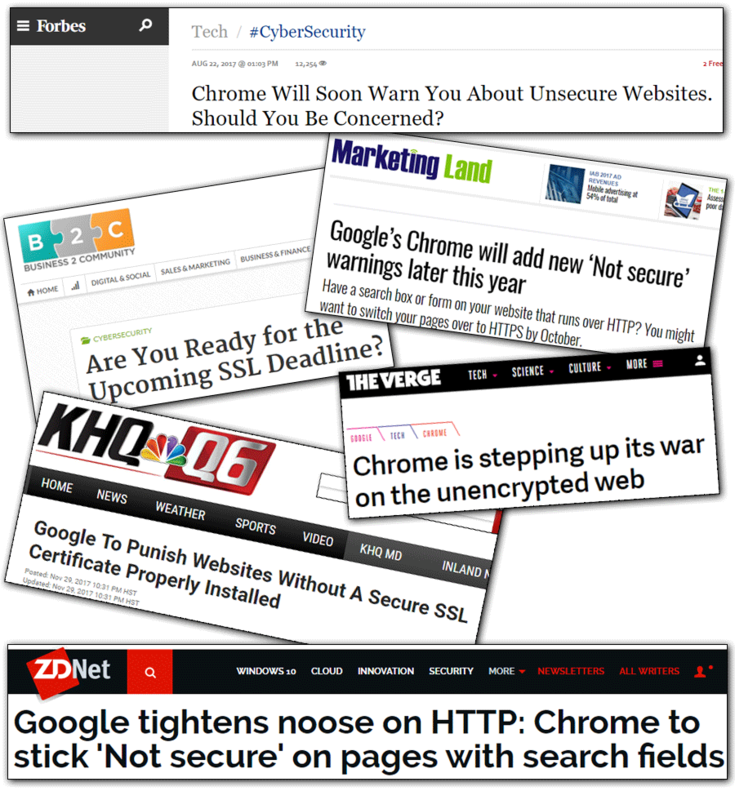 Google is planning to mark EVERY website that doesn’t use “https” with a big red ‘UNSECURE’ marker. Not only will the address bar mark sites as unsecure, Google is also planning to add this warning to every single form on web pages that don’t have SSL Certificates. Credit card forms – Websites will lose orders and revenue. Email and lead forms – Businesses will lose leads and customers. Search and contact forms – Websites will lose traffic and engagement. Bottom line: Websites without an SSL certificate will be filled with warning labels, rendering them useless to business owners. And the fact is over 90% of websites online DO NOT have an SSL certificate including my blog that you are on right now. Ooops! In short, I went online to check for just one keyword to see if I could get a website that I could pitch to help them install SSL. Remember that sites with an SSL certificate start with “https” instead of “http”. You can modify any Google search to only send you results that don’t have an SSL certificate by adding ‘-inurl:https’ to the search bar. 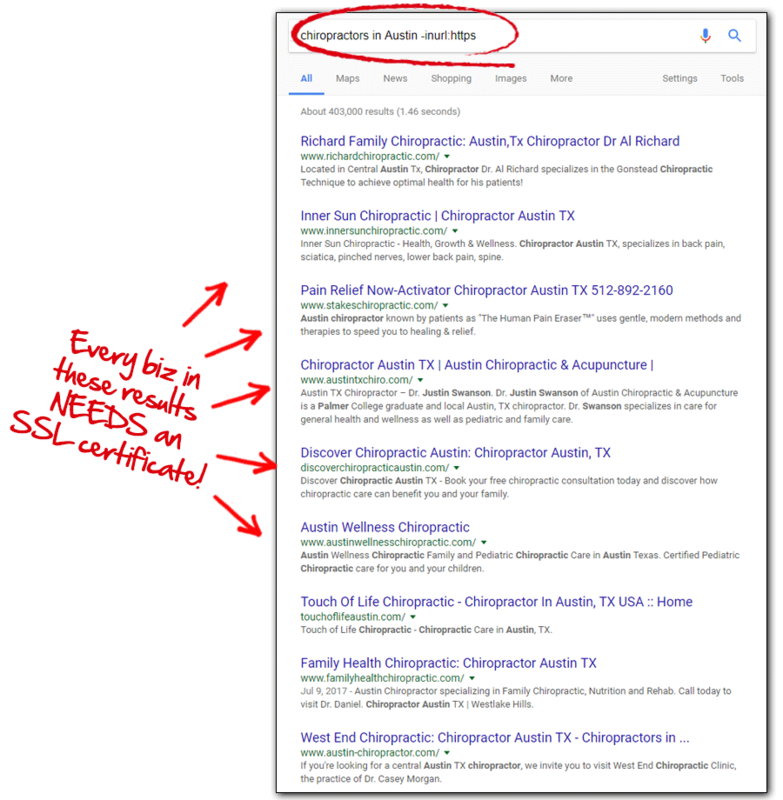 So I searched for ‘chiropractors in Austin’ and adding ‘-inurl:https’ to the search bar will return all the chiropractors (a health care professional focused on the diagnosis and treatment of neuromuscular disorders, with an emphasis on treatment through manual adjustment and/or manipulation of the spine.) in Austin who do not have an SSL certificate installed on their website: …and here was what I found. That’s the result I got just targeting one out of many profession in medical field alone. And even restricted to just a city. Now, you will agree with me that every one of these results are a potential client. They MUST install an SSL certificate, or their sites will be marked as ‘UNSECURED’. And more importantly, millions of businesses are right there who needs to get this fixed on their site. The majority of these business owners are completely unaware of this problem. Sending them a quick email explaining these changes gave me a 80% response rate when I use the right message to tell them why they need to fix their site. By educating prospects, I established immediate rapport and trust. These emails were written to give massive value by explaining the problem, and implying to the business owner that I have a fast and easy solution (all without a sales pitch). This prompts the business owner to pitch me on buying my solution. Although, there are a handful of Reseller SSL providers that will do all of the work for you installing the SSL Certificates for your clients. These services are white labeled with your information, meaning the business owner never knows you are reselling the service AND they offer one-click installation to their resellers. A basic SSL certificate costs $20 to $100 from these resellers, and can be sold for $500 or more to business owners. Not all SSL Certificates are created equal. Some have better encryption and others are issued by better authorities. Highly regulated industries like medical and law offices require stronger SSL certificates to keep patient and client data safe. These certificates can cost as much as $1,000 from resellers, and resold for $5,000. That’s exactly the businesses I always target. Targeting these niches will allow you to earn more money from each certificate you sell, and is just as easy as selling cheap certificates. You can even headover to Fiverr and higher an expert to do all the work. I have been offering this service for the past four weeks on Fiverr. The image below is just one of my recent earnings just installing SSL Certificates for clients since Google first announced this change without me even doing it. I simply hire people to do it while I just deliver the finished work and go to bed with my profit. Here is the finished work I did for my client. Once I confirm that the domain is active, I’d just grab a screenshot of it like the one above and attach it to my delivery message once the work is completed. Although, I already knew how to install SSL Certificates on websites. But I simply wanted to outsource it so I can continue with my other projects. And everything worked very fine. So here you have it. That’s exactly how I earned $400 recently by offering SSL Certificates on Fiverr. You too can go ahead and start offering that. If you care, I want to hand you a premium guide that thought me step by step on the right way to profit from SSL Installation by targeting the right client, how to pitch them and how to scale things up. I got everything I needed to know and get started with earning money selling SSL Certificates. It helped me hit the ground running and land about 4 clients immediately within two weeks even though all the payment all together did not reach $500. It showed me how to use email in pitching and I scaled it up by adding the service to my Fiverr account to gain their trust. I was able to win over my clients so easily because a complete set of email marketing templates was well listed for me inside the guide. All I do is just copy, paste, edit and send. In short, it removed all the guesswork out of prospecting, all I just use to do is pick the template I want to use, add my information and send it out to the prospects and follow up on replies or pitch more businesses as directed. You can start doing this Hot Business too. It doesn’t take away your time at all when you outsource it. I want you to come in as well. You too can do this. You can make lots of money just delivering this service. Demand for SSL certificates is set to explode once Google makes the final changes to their Chrome browser in the coming weeks/months. And millions of websites are yet to get theirs fixed. And probably hundreds of thousands businesses don’t even know what they call SSL Certificate. Once Google makes their final update, I intend to compile a guide for around $15 or N8,000. I think you’d agree that’s a fair price considering how it short cuts the pains involved in selling SSL Certificates. Before that happens, I want to get my loyal customers and subscribers and readers to start profiting just installing SSL Certificates with just a little investment. NO Hard selling – Simply alerting unaware business owners to this problem is enough to get them begging to buy a solution from you. NO Technical setup – You can even hire someone to do it while you get your own profit from it. Reselling the right service means all the work is done for you. NO Cost to get started – YOU collect fees for providing this service and pay the SSL provider AFTER you have collected the money. Guaranteed Profit: You can get over 500% profit margins just doing this and one single successful order can make your monthly income. You can get everything set up today once you download the guide for just less than $10. I spent over $120 getting the whole information even though I’ve made back my profits over five times. You can lay your hands on it right away by getting it here or here. Whichever works for you. Once your payment is successful, you would be directed to the download page and you get access to use the same guide I’m using to make extra money online just helping people get SSL Certificate installed on their site without me doing the work. Actually, I can easily give this out for FREE but the value in it might not be appreciated. Just shake your wallet and get it. You’d certainly profit from it overtime. You’d love it especially when you start getting replies to your mails. PS: Everything is well laid out from sourcing your clients to sending them your pitch. Its well detailed for anyone to understand. I was surfing recently and reading through some threads on Facebook groups. I came across a recent thread where loads of people are still yet to get SSL on their website and a handful of them were requesting to get theirs done for them. There’s lots of money to be made in this. Millions of individuals and businesses are yet to set theirs up. You can be their savior! Just take the step and start offering it. I just shared one of the gigs I offer on Fiverr and I detailed how I did it. You too can can start offering this service. If you want to get result faster, I’d advise you get the guide I just recommended. Its completely detailed and proven to work for anyone. The only work that could take your time is just setting up your Fiverr gig which I even shared an easy shortcut to get it done under 10mins as an added bonus to the guide plus the secret I used that made almost any business replies my mail to them. I even shared what happened between I and this client in my bonus report. How we ended the deal would amaze you. You shouldn’t just miss out the secrets revealed in my own bonus alone. Its just so powerful. Take advantage of this offer now. The value is “Gold”. You can get the guide via PayPal here or pay in other currency here.